From A Fan! We are not stupid, Sir! Please Keep Your Head High, Sir! Yesterday night a group of us good getting together friends were having a meal at this Arabian Restaurant in Ghobrah and the subject starting moved to your columns articles. And your call about more Omanis to be needed represented in the especially English press and media as it is now being controlling and dominated by Indian people mainly and also some British peoples. You also called for more stronger quality powering Omani Managers in the Press and media. Believe me Sir that people mistake us to be not knowing and not smart people and they can fool and play with us. But if they cannot learn than they will never learn in future. We are not stupid peoples. We aware and knowing too. So Ustaadh please rest now. You have said it but they ignore you and not listen. You have done your job and duty as few Omanis that really care and feel. You take rest because you are now done and take rest Sir. Look after family only now. Like you always tell us to take care! Ever admirer and fan to you Sir. We will never forget you till end of us. Book By Majid Al Suleimany – Omani National. “A Cry for Help!” focuses on the particular type of management that is being used in the Arab workplace while explaining the context and perspectives in the work environment. He goes on to explain what is peculiar, special, or particular to that work in the context of, and in comparison to, management styles of other nations. Majid Al Suleimany resides in Oman with his wife and four children. He has published four other books: “Psychology of Arab management!,” “The Sequel – Between Us Only!,” “Short Takes – Between Us Only!” and “Between Us Only! Book One.” He has two others in production: “Between Us Only! The Sequel Three” and “Behind the Wheel!” Al Suleimany is also a columnist for The Oman Daily Observer. He has worked in management, human resources and as a consultant for over 35 years in Oman. Arab Management: Far Deeper In Troubled Waters! 2 Still the ever increasing lack of ethics, principles, professionalism and tolerance in the workplaces. 3 With now ever more increased radicalisation, extremism and fundamentalising of the Offices environment and in similar to the overall similar fast changing facts of the ground in the region. 4 A Tell All As It Is in outlooks, approaches and focuses still prevalent and dominant. 5 It looks into the future in Prophecy and Prediction of what is expected and what is to come – immediately now, in the short term and in the future. Addressing the increased extremism, fundamentalism, and still the ever increasing now lack of tolerance and forbearance in the Arab workforce, Author Majid Al Suleimany presents Arab Management: Far Deeper In Troubled Waters! – Context and Perspectives – Arabian Management Series. Oman, UAE – United Arab Emirates, Qatar, Kuwait, Bahrain and Saudi Arabia. In deep self-analysis and in consciousness, it critically looks into and assesses any changes in particular – if any – in Arab Management – post The Arab Spring Uprisings that shook the countries in the region post January 2011 – after the First Arab Spring Uprisings in Tunisia with the self immolation of Mohamed Buazizi in Tunisia. v Changes in the Arab Management aspects (if any!) – post the Arab Spring Uprisings from January 2011 onwards. v Lessons that have still not been learnt despite all the changes in the MENA Region in Arab Spring Uprisings. v Still the ever ‘Ostrich Head in the ground’ – ‘Hard of Hearing’ and Push The Dirt under the carpet’ Management approaches – especially from the local environments, focuses and outlooks! v The ever faster growing radicalization of the local staff – especially The Youth and in particular. v Still some misbehaving expatriates – and the old guards locals! In Arab Management: Far Deeper In Troubled Waters! Majid Al Suleimany – an Arab Management Consultant, Advisor and Expert – focuses on what is particular about the type of Arab Management, its context and perspectives, and what is peculiar, special, or particular to that work in the context and in comparison to management styles of other nations. exposes the new reality and truth – and moves away from the trend and approach of hiding issues and problems. “Despite everything that has happened so far since the troubles started last year – nothing has changed much at the workplaces – if not for the worse in divisions between locals and expatriates – and in rivalries, polarisation, jealousies, envies – and lack of ethics, transparencies and professionalism” – A VP HR (Omani). This will be a Tell-All – at whatever repercussions and consequences. Enough is Enough! Things cannot be allowed to go on like this – too many lies and deceptions already! I am looking for partial sponsorship, financial backing and support especially from those who can – and believe in me – and in this planned new book! Books by Majid Al Suleimany – The Omani Author, Writer, Columnist and Publisher. Please visit my above websites for books in Arab Management issues and aspects – and as written in English. There are few books as such written in English and published by the Arab locals themselves – and in this style and format from a personal perspective – and in deep self conscience, criticism, analysis and review. 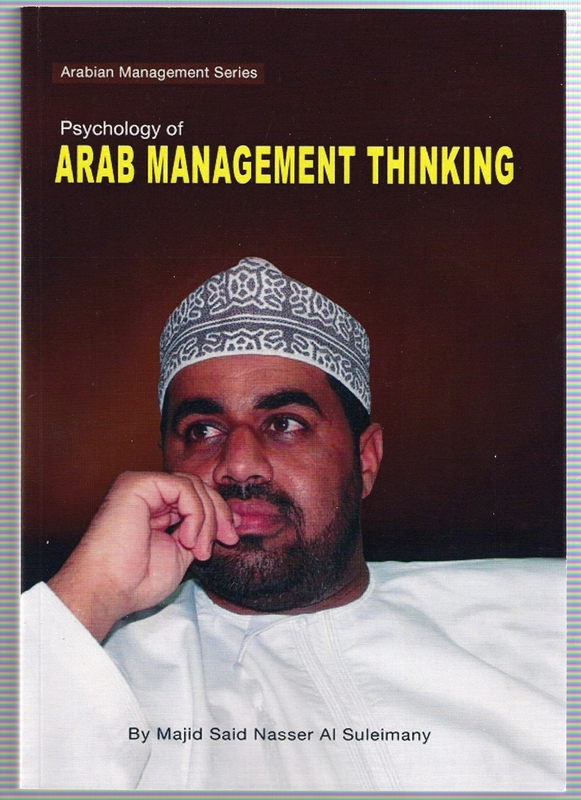 The First Book – Psychology of Arab Management Thinking – was published in January 2009 Context and Perspectives – Arabian Management Series. The Second Book – A Cry For Help! – published in September 2009 – Context and Perspectives – Arabian Management Series. A Cry For Help! sort of foretold and prophesied The Arab Awakening and Uprisings – by highlighting the issues and aspects that were also revealed by The Arab Youth cries and grievances – mainly centred on jobs, their outlooks, their participation – and need for involvement – and their future – and for their destiny and legacy. Psychology book critically reviewed shortfalls and out comings in Arab Management – and ways and means to improve and in changes required to overcome – and to be seen as successful and in winning! The books are written from a personal perspective and context covering the Author’s over 35 years as a Management and Human Resources Professional, Expert, Advisor and Advisor in Oman and GCC. B Between Us Only! Series Books. You will also find Between Us Only! Series books from The Oman Daily Observer Columns for the last 11 years covering interesting wide varied and relevant subjects and topics – both local, Arab, GCC and International. Between Us Only! – The Sequel – Between Us Only! – and Short Takes – Between Us Only! The First book was published in Oman. Short Takes have emotional short stories with pictures and caricatures. 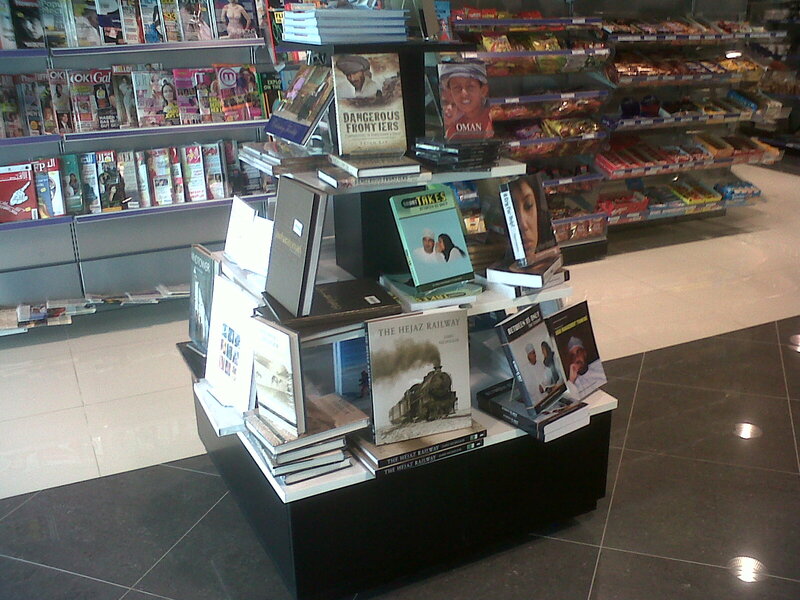 In Oman books are available at Family Bookshop Medinat Al Qaboos and at WHSmith (The Wave). In UAE at Magrudys and Jashanamal – by ordering only! Arab Management – Reality or Mirage? Despite all that has been happening so far – in the Arab Management arena – nothing has changed much – so far! In the offices there are still red tapes, bureaucracies, bias, prejudices, subjectiveness, rigidness, no-change-outlooks, dogmas, fixed and rigid ideas, polarisation differences. Decisions still take long to make – and they are always against the poor, weak and those in sufferance. The Top Managers are aloof and indifferent – do-not-touch-me-or-come-near-me approaches and styles – with bigger incomes, benefits and fringe benefits. In others are no changes at all. People are suffering in silent protests and disquiet – like a cinder fire – until it burst out unexpectedly – as has already happened! I cried – and wrote the book in 2009 and as published – one year BEFORE the Arab Spring Uprisings! I cautioned and warned – to no avail! Only now things will get more worse! Than ever before! Or the Romans said – Those that the gods want to destroy make them not see, hear or speak! Or nearer at home – There is noone so blind but with eyes but cannot see – deaf with ears but cannot speak – and noone so dumbe but with a mouth – but cannot speak! Or still – you cannot remove a tiger’s stripes pr a leopard’s dots (spots)!! It is the more worse in public places – noone hears you! For a good outlook, perspective and context, please visit www.majidbooks.com – www.mymajidbooks.wordpress.com for details of the Management Books in English by the famed Omani Author Majid Al Suleimany. 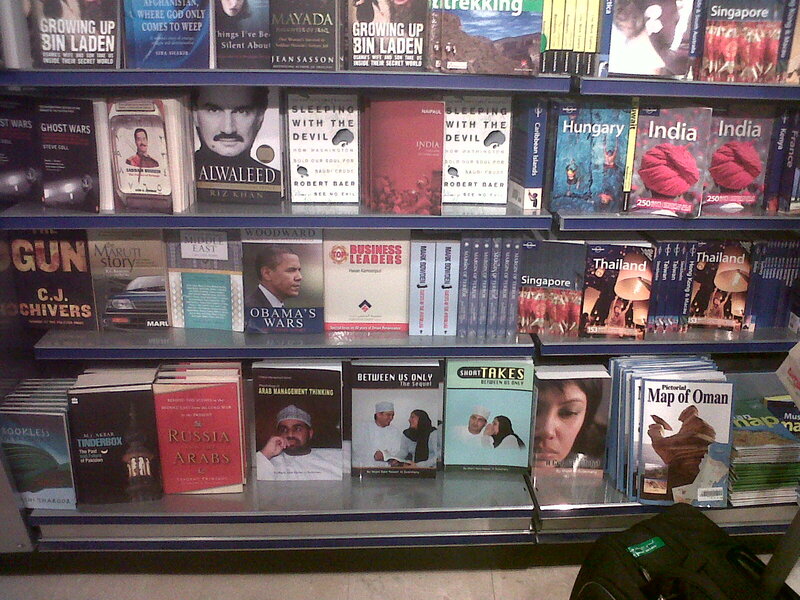 Books sold in Family Bookshops, Borders and WHSmith in Oman – Magrudys, Jashanamal in UAE. Uncategorized • Tags: A Cry For Help! book, Arab Management Books in English, Book Review - An Intelligent Man’s Guide To Arab Management.! (Two Books), GCC, Majid Al Sulerimany, MENA, Oman, Psychology of Arab Management Thinking! 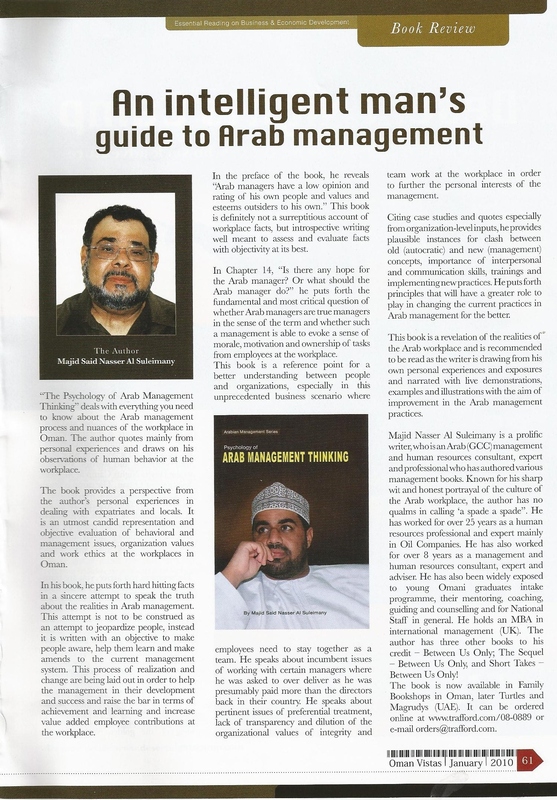 Book Review – An Intelligent Man’s Guide To Arab Management. Oman Vistas Magazine – Essential Reading on Business & Economic Development – February 2010. Psychology of Arab Management Thinking deals with everything you need to know about the Arab Management process and nuances of the workplace in Oman. The Author quotes mainly from personal experiences and draws on his observations of human behavior at the workplace. The book provides a perspective from the Author’s personal experiences in dealing with expatriates and locals. It is an outmost candid representation and objective evaluation of behavioral and management issues, organization values and work ethics at the workplace in Oman. In his book, he puts forth hard hitting facts in a sincere attempt to speak the truth about the realities in Arab Management. The attempt is not to be construed as an attempt to jeopardize people, instead it is written with an objective to make people aware, help them learn and make amends to the current management system. This process of realization and change are being laid out in order to help the management in their development and success and raise the bar in terms of achievement and learning and increase value added employee contributions at the workplace. In the preface of the book, he reveals “Arab Managers have a low opinion and rating of his own people and values and esteems outsiders to his own”. This book is definitely not a surreptitious (secret) account of workplace facts, but introspective (thoughtful) writing well meant to assess and evaluate facts with objectivity at its best. In Chapter 14 “Is there any hope for the Arab Manager? Or what should the Arab Manager do?” he puts forth the fundamental and most critical question of whether such a management is able to evoke a sense of morale, motivation and ownership of tasks from employees at the workplace. This book is a reference point for a better understanding between people and organizations, especially in the unprecedented business scenario where employees need to stay together as a team. He speaks about incumbent issues of working with certain managers where he was asked to over deliver as he was presumably paid more than the directors back in their country. He speaks about pertinent issues of preferential treatment, lack of transparency and dilution of organizational values of integrity and team work at the workplace in order to further the personal interests of the management. Citing case studies and quotes especially from organization inputs, he provides plausible instances for clash of old autocratic and new management concepts, importance of interpersonal and communication skills, training and implementing new practices. He puts forth principles that will have a greater role to play in challenging the current practices in Arab Management for the better. 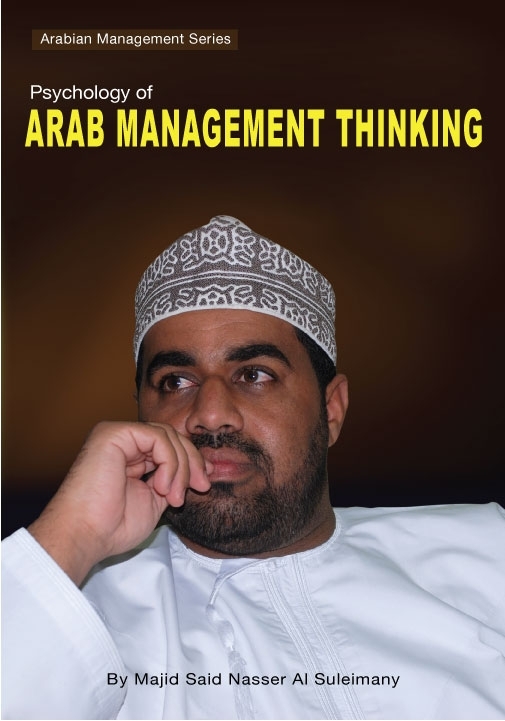 Majid Al Suleimany is a prolific writer who is an Arab (GCC – Omani) Management and Human Resources Consultant, Expert and Professional who has authored various (management) books. Known for his sharp wit and honest portrayal of the culture of the Arab workplace, the Author has no qualms in calling ‘a spade a spade’. He has worked for over 25 years as a Human Resources Professional and Expert mainly in Oil Companies. He has also worked for over 8 years as a Management and Human Resources Consultant, Expert and Advisor. He has also been widely exposed to young Omani graduates’ intake programmes, their mentoring, coaching and counseling and for National Staff in general. He holds an MBA in International Management (UK). The Author has four other books to his credit – the second Management New Book A Cry For Help! Between Us Only; The Sequel – Between Us Only! And Short Takes – Between Us Only! The book is now available in Family Bookshops in Oman, Borders and WHSMith – Magrudy’s and Jashanamal in UAE. Majid Al Suleimany is an Author. Majid is also a columnist for The Oman Daily Observer. He is a management and human resources expert, consultant, and professional. Married with four children, retired – he lives in Oman. He was congratulated for his first article, My Most Vivid Dream, by The Aga Khan in 1960s in Tanzania. He wrote for Petroleum Development Oman – PDO Al Fahal Magazine. Two articles, A New Outlook On Omanisation and Stray Thoughts On Traffic, were reproduced by The Times of Oman, where he used to be a contributor. He returned to The Oman Daily Observer as a weekly columnist writing Between Us Only! and At My Workplace! He is also a Columnist with KOM – Knowledge Oman – Society Speaks! He is now writing a book titled Sinking Deeper – No Money? No Honey! • February 2005 Between Us Only! – sponsored by MB and PetroGas, published by Al Nahda Printing Press in Oman. • November 2008 The Sequel – Between Us Only! – published by Trafford in Canada. • January 2009 Short Takes – Between Us Only! – published by BookSurge in the United States. • May 2009 Psychology of Arab Management Thinking – Context and Perspectives – Arabian Management Series, published by Trafford in Canada. • February 2010 A Cry For Help! – Context and Perspectives – Arabian Management Series, published by Trafford in Canada and the United States. Latest book on Arab Management. 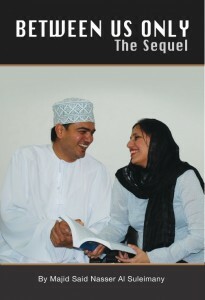 • Books sold in Oman in WHSmith and Family bookshops – see www.majidbooks.com on how to order the books. My Articles in The Oman Daily Observer. www.alsuleimany.com – Very Old Articles. www.majidbooks.com – My Five Books and Two in Arab management. www.majidsn.com – Views, Opinions etc.